The Soyuz TMA-19 (No. 229) lifted off to the International Space Station, ISS, on June 16, 2010, 01:35 Moscow Summer Time, onboard the Soyuz-FG rocket from Site 1 in Baikonur Cosmodrome. The spacecraft would remain docked to the outpost until November 2010. In the ISS schedule, the mission was known as 23S. 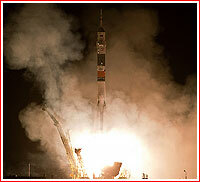 The 100th mission to build the International Space Station launched from Russian launch site in Kazakhstan. A Soyuz FG rocket carrying the Soyuz TMA-19 spacecraft lifted off from Baikonur Cosmodrome's Site 1 on June 16, 2010, at 01:35:19 Moscow Summer Time (June 15, 21:35 GMT). Onboard were Russian cosmonaut Fyodor Yurchikhin, along with NASA flight engineers Shannon Walker and Douglas H. Wheelock on their way to the International Space Station, ISS. The launch vehicle with the 7,220-kilogram Soyuz TMA-19 transport followed a standard trajectory to reach a 200 by 242-kilometer orbit with the inclination 51.66 degrees toward the Equator, enabling a two-day-long rendezvous profile with the ISS. A fully automated docking of the Soyuz TMA-19 spacecraft with the aft port of the Zvezda service module took place on June 18, 2010, at 02:21 Moscow Time (June 17, 2010, 22:21 GMT). After its initial parking at the service module, Soyuz TMA-19 is scheduled to re-dock to the newly delivered MIM-1 Rassvet module. The crew was expected to spend 163 days onboard the orbiting outpost and return home onboard of the same spacecraft. On June 28, 2010, at 23:13:48 Moscow Time (19:13 GMT), Yurchikhin, Wheelock and Walker undocked their Soyuz TMA-19 spacecraft from the aft end of the Zvezda service module and after moving around 40 meters away from the station re-docked the vehicle to its new location on the recently installed Rassvet module some 25 minutes later at 23:37:58 Moscow Time (19:37 GMT). During the maneuver, Yurchikhin used manual control. Expedition 25 Commander Doug Wheelock and Flight Engineers Shannon Walker and Fyodor Yurchikhin safely landed in their Soyuz TMA-19 spacecraft on the Kazakhstan steppe on Nov. 26, 2010, at 07:47 Moscow Time (10:46 local time; Nov. 25, 11:46 p.m. EST), wrapping up a five-month stay aboard the International Space Station. Russian cosmonaut Yurchikhin, the Soyuz commander, was at the controls of Soyuz TMA-19, as it undocked at 8:23 p.m. EST (Nov. 25) from the station's MIM-1 Rassvet module, NASA said. The trio landed 85 kilometers northeast of the town of Arkalyk. Working in frigid temperatures, Russian recovery teams were on hand within minutes to help the crew exit the Soyuz vehicle and re-adjust to gravity. After Soyuz TMA-19 undocking, the station was remained occupied by Expedition 26 Commander Scott Kelly and Flight Engineers Alexander Kaleri and Oleg Skripochka of the Russian Federal Space Agency. Their increment officially began with the departure of Soyuz TMA-19. After a busy week capped with the undocking activities on Nov. 25, Kelly, Kaleri and Skripochka caught up on their sleep on Nov. 26. They were to enjoy an off-duty weekend, routine station maintenance and daily exercise before kicking off their first work week as a three-person crew on Nov. 28, 2010. A new trio of Expedition 26 flight engineers, NASA astronaut Catherine Coleman, Russian cosmonaut Dmitry Kondratyev and Paolo Nespoli of the European Space Agency, were scheduled to launch from the Baikonur Cosmodrome on Dec. 15, 2010. They would then dock with the station and join its crew on Dec. 17, 2010.